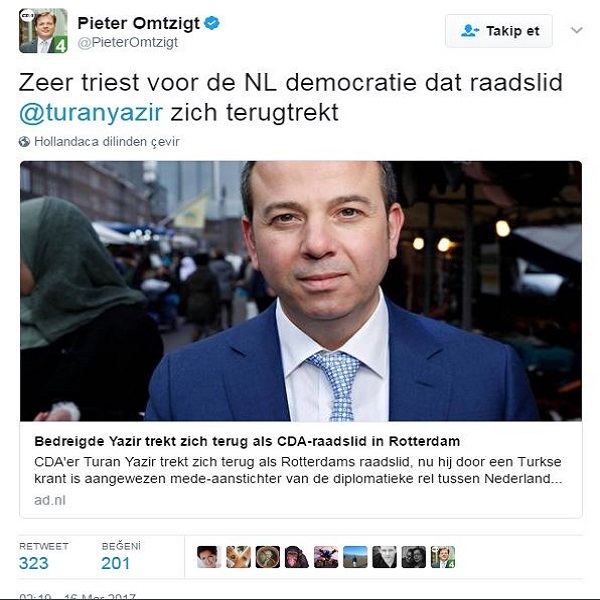 It is reported by nltimes.nl that a Dutch-Turkish CDA councilor in Rotterdam, Turan Yazır, is taking a leave of absence from his faction due to the increased threats targeting him. According to another report in NU.nl, Dutch-Turkish politician Yazır has got serious threats following pro-Erdoğan Turkish Daily Sabah publishing Yazir’s his full name, his photo and calling him partly responsible for the political fallout between the Netherlands and Turkey. 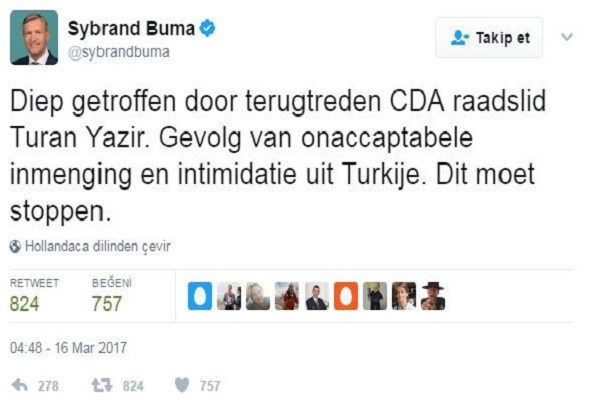 The CDA faction in Rotterdam confirmed, in a written statement, that Yazır’s leave of absence has to do with the increased tensions in the Turkish community in Rotterdam. “The tensions in Rotterdam as a result of developments in Turkey have such an impact that it is impossible for Yazır to duly exercise his duties as councilor,” faction leader Sven de Langen said. The Turkish newspaper calls Yazır a politician that works with “fascists in the Netherlands, like Geert Wilders.” According to the newspaper, he and two other CDA councilors support the PVV leader because they are against Erdoğan. In a previous interview with newspaper AD, Yazır said that he is considered a traitor in Turkey. He would say nothing further in fear of further escalation. According to the report, during his leave of absence, Turan Yazır will be temporarily replaced by Christine Eskes. The 42-year-old Yazır is known as a sympathizer of Gülen movement and was also the target of threats after an attempted coup in Turkey last year. Stockholm Center for Freedom (SCF) has released a report last month titled “Erdoğan’s Long Arm in Europe: The Case of the Netherlands” and exposed Turkish government profiling, harassment activities in Netherlands which led to physical assaults and arson attempts against Turkish President’s critics. The Turkish government sees Fethullah Gülen as Turkey’s autocratic President Recep Tayyip Erdoğan’s main rival and blames the cleric for the failed coup. Gülen (a.k.a. Hizmet) movement is inspired by the US-based Turkish Muslim intellectual Fethullah Gülen who has been advocating science education, interfaith and intercultural dialogue and community contribution. Gülen has been a vocal critic of Turkish government and autocratic President Erdoğan on massive corruption in the government as well as Turkey’s aiding and abetting of radical groups in Syria. Erdoğan launched an unprecedented persecution against Gülen and his followers in December 2013 right after major corruption probe that incriminated Erdoğan’s family members. In the currently ongoing post-coup purge, over 135,000 people, including thousands within the military, have been purged due to their real or alleged connection to the Gülen movement, according to a statement by the labor minister on Jan. 10. As of March 1, 93,248 people were being held without charge, with an additional 46,274 in pre-trial detention. A total of 7,316 academics were dismissed, and 4,070 judges and prosecutors were purged over alleged coup involvement or terrorist links.